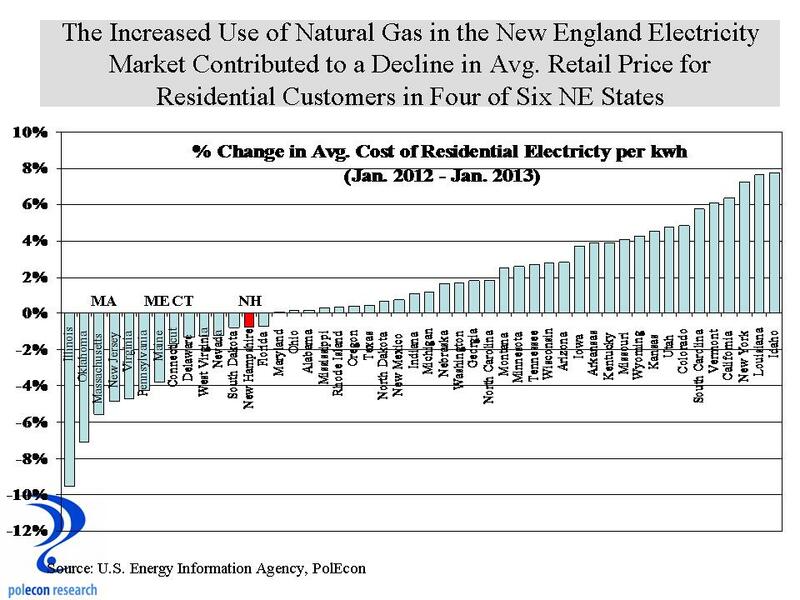 Four of the six New England states (CT,ME, MA and NH) had lower average retail prices for residential electricity customers in January of 2013 than they did in January of 2012 (chart below). Most of that is a result of the increasing sales into the region’s electricity market of electricity generated by natural gas which is priced lower than the electricity generated using other sources. The decline in the average price in NH is smaller than in some other states but it could have been, and could still be, larger if retail competition in the residential electricity market takes hold. 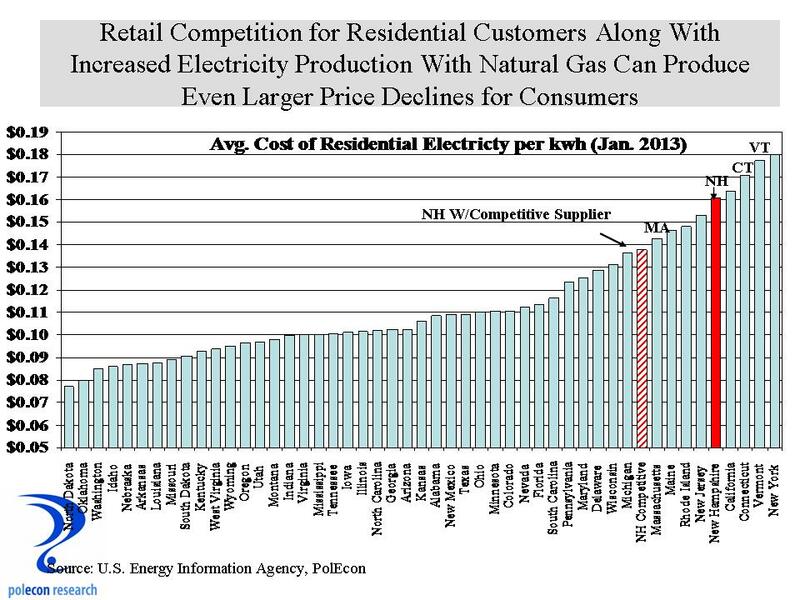 The chart below shows the average cost of retail electricity for residential customers in the continental United States in January of 2013. New Hampshire and all of New England have among the highest average rates but based on the contract information from the largest competitive suppliers of residential electricity in New Hampshire, the average price would be significantly lower (at least until November of 2013) for those who choose the lowest rates available from competitive suppliers (other higher rates are available that let customers choose to purchase a higher percentage of electricity generated from ‘green” sources). I was going to make this a much longer post and include a discussion of why the warnings by some about an “over-reliance” on natural gas in the region are overstated but not inaccurate (the natural gas pipeline limitations to the region are real but more likely to be remedied than not with increased natural gas usage in the region) but I will save that for another day. The reputation and belief in free(er) markets and competition have taken a beating over the past several years so for now I am just going to enjoy highlighting of one of their recent successes. This entry was posted on March 28, 2013 at 1:34 pm and is filed under Electricity, Energy, Natural Gas, NH. You can subscribe via RSS 2.0 feed to this post's comments.